IAM members weren’t just celebrating the United States’ independence this July Fourth. The success of the Juno spacecraft reaching Jupiter’s orbit, a mission the Machinists Union was an integral part of, gave us another reason to rejoice. IAM members built and launched Juno, which reached its destination after a five-year, 1.8 billion-mile journey to our solar system’s largest planet. 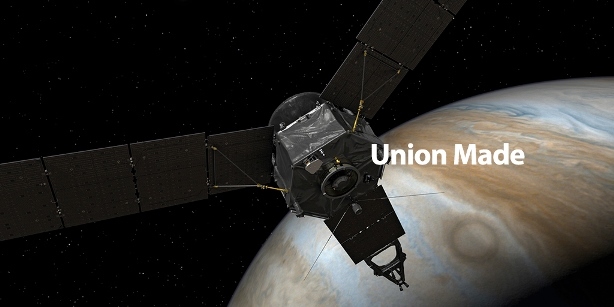 Juno was built by Local 44 members at Lockheed Martin in Decatur, AL and launched, in 2011, by IAM Local 610 members at United Launch Alliance in Cape Canaveral, FL. The spacecraft will soon become the first to see below Jupiter’s dense cover of clouds. Juno will stay in Jupiter’s orbit for the next 20 months, collecting data on the Gas Giant and sending it back to NASA to be studied. Learn more about Juno’s historic mission from NASA.